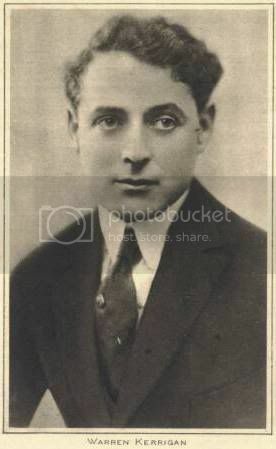 J. Warren Kerrigan was an American silent film actor and long time partner of James Vincent. 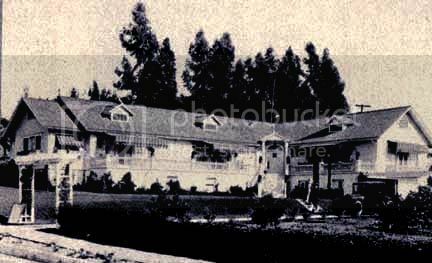 They lived together at 2307 Cahuenga Ave, Hollywood, for over 14 years - from at least 1922 to 1936. He may have also had a relationship with former female impersonator Mansel V. Boyle, popularly known as "Vardaman". Mansel also lived with Kerrigan at the Cahuenga residence from 1936 to 1938 - according to California Voter Registration records. J. Warren Kerrigan was born George Warren Kerrigan on July 14, 1879 in Indiana (probably New Albany) to John and Sarah (McLean) Kerrigan. His family called him "Jack" and he would later use several variations of his name including "Warren Kerrigan" and "Jack W. Kerrigan". Although some sources state that he was a twin with brother William Wallace Kerrigan, census records and the California Death Index indicate that William was born July 25, 1882. Jack died June 9, 1947 in Orange County, California of pneumonia. J. WARREN KERRIGAN is twenty-five years old and has been in motion pictures since he became of age. His professional career began when he set out from his home in Louisville, Ky., bound for New York with unlimited ambitions and experience in no line whatsoever. His mother had him checked for the ministry, his father had decided that he should be a lawyer, and one of his elder brothers (Warren is the eighth and youngest son) had him picked for a prize fighter. Warren himself was certain that he wanted to be an actor. Mr. Kerrigan's first stage experience was with Clay Clement, his brother-in-law, in a production of Sam "Houston". He also played juvenile lead in "Brown of Harvard" and "The Master Key" and following these engagements was featured in "The Road to Yesterday." It was while playing in Chicago in "The Road to Yesterday" that a number of Essanay people saw the performance and made him an offer to join their company. Upon the organization of the American company, Mr. Kerrigan was the first member to be engaged, and for a period of three years played in every one of the firm's pictures. Later he became a member of the Universal company with which he is now associated. Mr. Kerrigan likes country life - dogs, chickens, horses, green fields and sunshine. He lives in Hollywood, Cal., with his mother. Aside from his acquaintance in the picture world, J. Warren Kerrigan of the Kerrigan-Victor company, is known as a bird and animal fancier. At his home in Hollywood, Cal., he has a collection of blooded dogs, hares, pigeons, chickens and ducks, several of which have taken prizes at local shows. As the dauntless outlaw who ruled the blue grass country with an iron hand, J. Warren Kerrigan is said to be at his best in "A Kentucky Idyl," at the Happy Hour to-day. He feared neither religion nor the laws of men, but his reformation was finally brought about by the daughter of a traveling evangelis. Ethel Phillips and Helen Leslie appear in Mr. Kerrigan's support. J. Warren Kerrigan is to be released in a three weeks' serial entitled. "The Adventures of Terrence O'Rourke," a story written by Louis Joseph Vance. The serial will be released immediately after the close of "The Broken Coin," and will bridge the gap until the new big serial, "Graft," is release. It is nearly election time in Universal City and the two most favored candidates are Herbert Rawlinson and J. Warren Kerrigan. The women who exercise their right of franchise at the movie city are keeping quiet and it is rumored that a "dark horse" will appear at the last minute and win the fight for the women have the majority. J. Warren Kerrigan was laid up with a broken leg for about eight months.. He has returned to the screen now and you may be able to see him in "Toby" in a short time. Now just among us girls it is said that his engagement to —- is about to be announced. But just among us girls, understand. Address Mr. Kerrigan at the Paralta studio. J. Warren Kerrigan is in Los Angeles, laid up with a broken leg. Horse stepped into a gopher hole and then laid down on J. Warren's leg. Kathleen Kerrigan, the talented sister of J. Warren, has an important part in her brother's latest Brunton production, "One Week-End," a lively comedy of New York society life. Although not as well known to picture fans as Warren, Miss Kerrigan has a long and enviable record on the stage and screen. She starred in the Belasco production of "Sweet Kitty Bellairs," the play in which Jack Kerrigan made his initial appearance before any audience. Hollywood, Cal. - (AP) - An attack of pneumonia, culminating several years of poor health, has ended the colorful film career of J. Warren Kerrigan, 67, one of the first matinee idols of the silent screen. The actor, whose best remembered role, perhaps, was in "The Covered Wagon," made by the veteran director, James Cruze, and who retired from pictures in 1923, succumbed Monday at his Balboa beach home. Playing with Kerrigan in "The Covered Wagon," in which he was a sensation, wearing a gleaming suit of white buckskin throughout bitter western action, were such well known film personages as Ernest Torrance, Lois Wilson and Alan Hale. Another of his better known pictures was "Captain Blood." Born George Warren Kerrigan in Louisville, Ky., the actor first struck fame on broadway in "The Road to Yesterday" and "Brown of Harvard". the latter was produced in 1910. Leaving Broadway, he made his first picture in Chicago with Essay Productions. Then he came to California with the old American Film Company. Among Kerrigan's early pictures were "Rory O' the Bogs," "The Dollar Kid," "The Dream Chester" and "Live Sparks". Seldom one to go in for lavish entertainment, for which Hollywood long has been known, Kerrigan remained somewhat aloof and invested his money in annuities and real estate. Until recently, he had lived quietly on his estate in nearby Sunland. Then he moved to Balboa Beach. Survivors include three brothers, Wallace W., Robert and Edward, and a sister, Kathleen. Kerrigan Sarah M. Mother 67 widow Canada Scotland Ireland None . Kerrigan Robert E. Brother 30 single Kentucky Ireland Canada None . Kerrigan Robert E. brother 45 single Kentucky Ireland Canada none .